Can we predict population responses (range shift, adaptation or extinction) to an environmental change based on current phenotypic and biological age structures of natural populations of marine top-predators? Specifically, I am interested in (A) how climate- and human induced environmental changes affect physiology, reproduction and survival of different phenotypes in wild seabird populations; and (B) the consequences of such differential selection pressure on individuals for the spatial and temporal dynamics of their populations. Barger, C.P. & Kitaysky, A.S., 2012. Isotopic segregation between sympatric seabird species increases with nutritional stress. Biology Letters, 8, pp.442–445. Dietrich, M. et al., 2012. Inter-oceanic variation in patterns of host-associated divergence in a seabird ectoparasite. Journal of Biogeography, 39, pp.545–555. Dorresteijn, I. et al., 2012. Climate affects food availability to planktivorous least auklets Aethia pusilla through physical processes in the southeastern Bering Sea. Marine Ecology Progress Series, 454, pp.207–220. Drovetski, S.V. 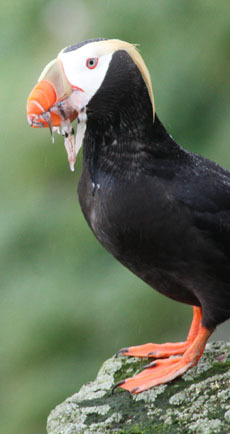 et al., 2012. mtDNA haplotypes differ in their probability of being eliminated by a mass die-off in an abundant seabird. Heredity, 109, pp.29–33. Satterthwaite, W.H., Kitaysky, A.S. & Mangel, M., 2012. Linking climate variability, productivity and stress to demography in a long-lived seabird. Marine Ecology Progress Series, 454, pp.221–235. Schultner, J. et al., 2012. The ecology of stress: Fat or lean: adjustment of endogenous energy stores to predictable and unpredictable changes in allostatic load. Functional Ecology. Sydeman, W.J., Thompson, S.Ann & Kitaysky, A., 2012. Seabirds and climate change: roadmap for the future. Marine Ecology Progress Series, 454, pp.107–117. Harding, A.M.A. et al., 2011. Adverse foraging conditions may impact body mass and survival of a high Arctic seabird. Oecologia, 167, pp.49–59. Karnovsky, N.J. et al., 2011. Inter-colony comparison of diving behavior of an Arctic top predator: implications for warming in the Greenland Sea. Marine Ecology Progress Series, 440, pp.229–240. Lobato, E. et al., 2011. Seabirds and the Circulation of Lyme Borreliosis Bacteria in the North Pacific. Vector-Borne and Zoonotic Diseases, 11.